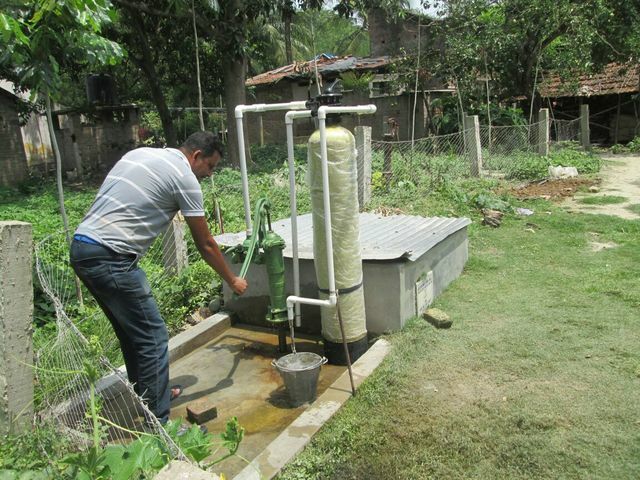 This site #PW195 is in Bargoriya village of Swarupnagar block in the district of N 24 Parganas. Esmail Biswas donated the site for the community. The name, ID, pictures and geocodes have been revised from ICDC school that has been shifted to PW202. To have the community use the water for drinking and cooking purposes a odor and iron removal filter is installed at this on 25th may 2016. After one day of pumping and back washing 12 families have started using the water from today Friday 27th. Total Cost approx is 10,000 INR including 500rs transport, 1800rs hand pump. It removes iron, odor, 70% manganese. The water sample will be collected to analyse iron, manganese and total coliform and e.coli after one week of its operation. Health meeting held in bi tech well.Total people 14.male 6.female 8.